Khatling Bamak (Glacier) is the headwaters of the Bhilangana River in Uttarakhand, India. The Bhilangana River flows into the Tehri Reservoir(2400 MW), that along with the Bhilangana River’s three small hydropower projects (50 MW), make these glaciers key contributors to regional hydropower. 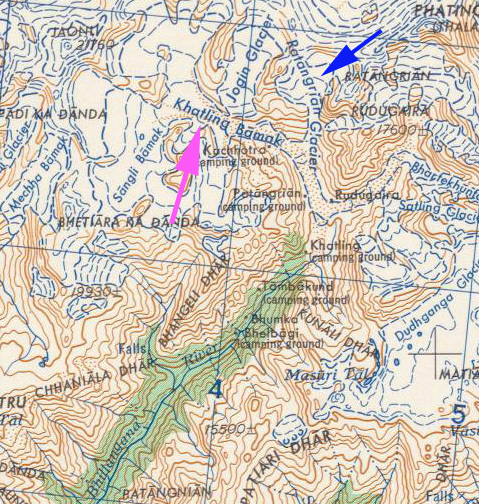 The glacier was formerly joined with the Ratangrian Glacier as indicated by the map, but the two have separated with the Ratangrian Glacier now terminating 1.7 km upvalley of this former connection. The 10 km long glacier is fed by several mountain peaks including Jaonli over 6000 m. The lower section of the glacier is debris covered. Here we examine satellite imagery from 1998, 1999, 2011 and 2013 to identify recent changes. The yellow arrow in the images indicates the lower limit of the clean ice in 1998, the pink arrow the lower limit of the clean ice in 2013. 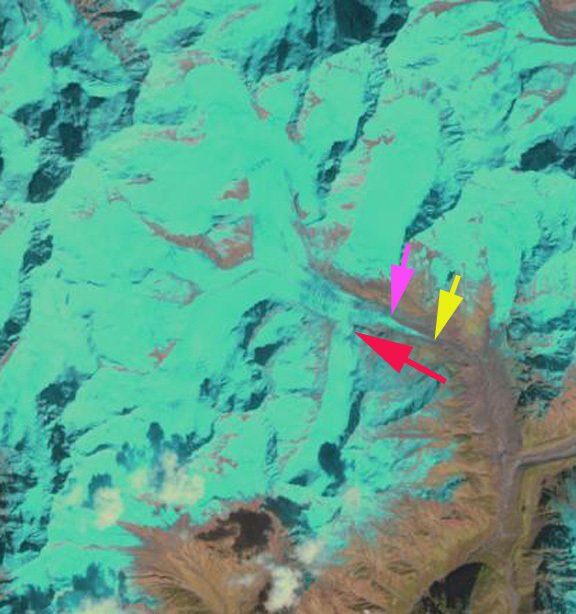 The red arrow indicates a significant tributary to Khatling Glacier joining from the south. The terminus is not evident in the Landsat images, but can be observed in the Google Earth imagery. In 1998 the southern tributary joins the Khatling Glacier at 4500 m, 2.5 km upglacier of the terminus. The clean ice extends to within 1 km of the terminus. In the 1999 image the same connection with the southern tributary and location of the clean ice is evident. 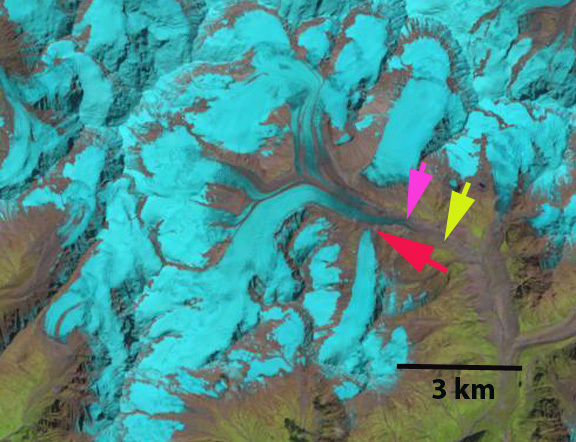 By 2011 the southern tributary is no longer connected to the glacier, red arrow. The clean ice does not reach the yellow arrow. 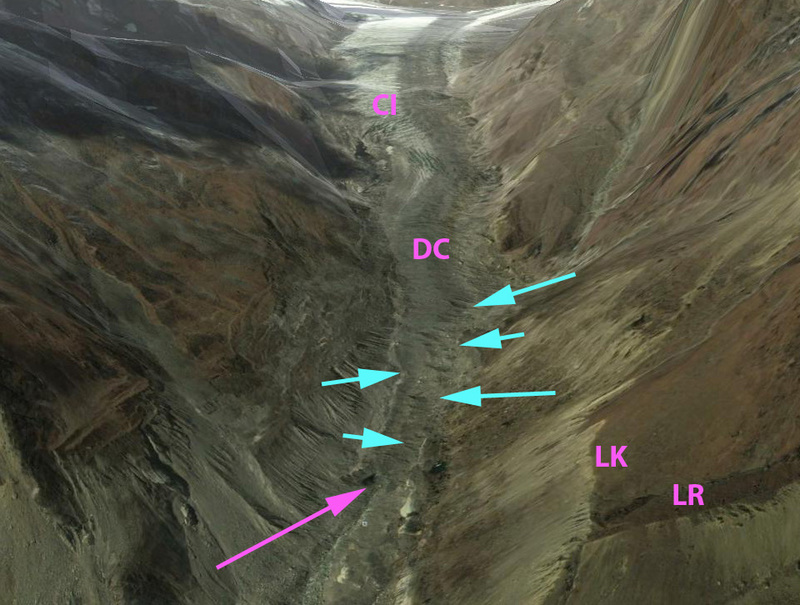 The spread of the debris cover is not from additional avalanche input or flow from upglacier. The spread occurs as a glaciers ablation melts the clean ice faster and the debris cover where thick slows ice melt. This leads to topographic highs covered by debris cover that than slide-tumble down onto the clean ice. Without much input from upglacier the debris within the ice is melted out and can continue to concentrate at the surface. This is common among retreating glaciers with debris cover to have the debris begins to spread across the glacier. By 2013 the clean ice extent has retreated 1000 m from 1998 to the pink arrow of 2103. The southern tributary has retreated 200 m from its former junction. The terminus of the glacier has retreated 400 m from 1998-2013. 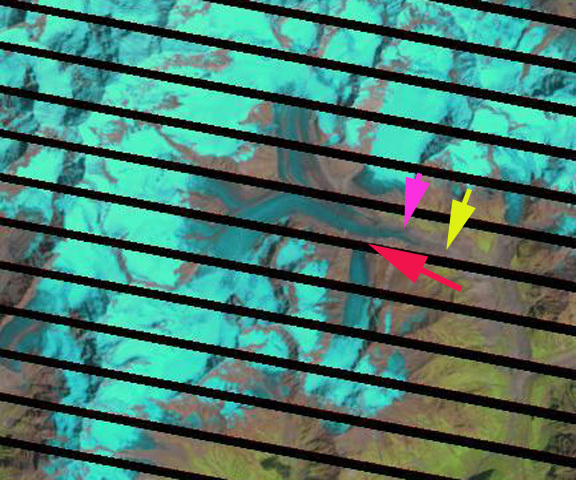 A close up of the terminus from 2011 Google Earth imagery indicates the outlet river (pink arrow) issuing from beneath the stagnant debris covered ice (DC) and the distance from the terminus to the clean ice (CI). The lateral moraines of the Khatling and Ratangrian Glacier are also shown. 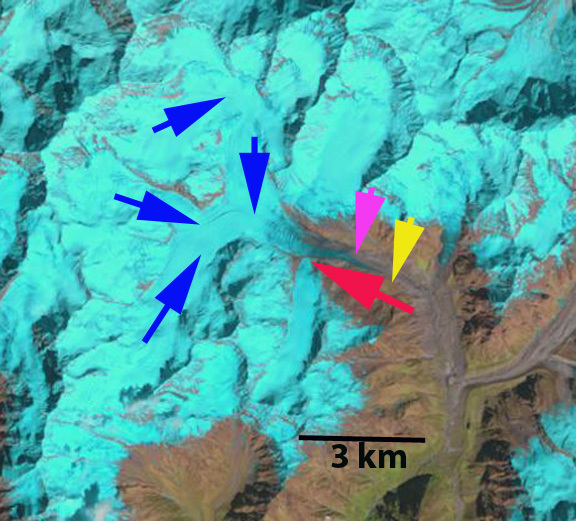 The hummocky thin nature of the lower 700 m of the glacier is evident, light blue arrows, indicating an area that will be lost from the glacier soon. Khatling Glacier retreat is similar to that of nearby Gangotri Glacier and Jaonli Glacier that also feed Tehri Dam. This entry was posted in Glacier Observations and tagged bhillangana glacier melt, climate change glacier retreat, India glacier retreat, Khatling Bamak glacier retreat, uttarakhand glacier retreat. Bookmark the permalink.